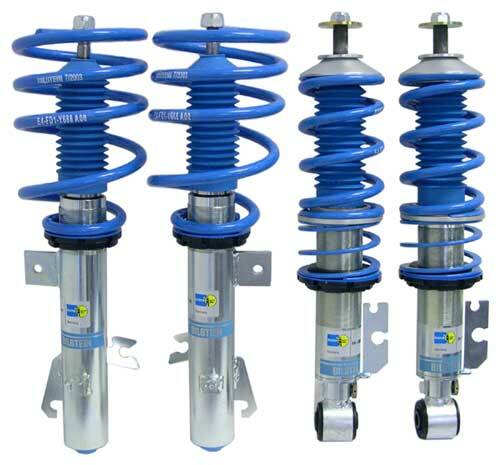 Bilstein PSS9 Coilovers for 2002-2006 R50, R53 MINI Cooper and Cooper S, and 2005-2008 R52 MINI Convertible. These are some of the best coilovers available for your MINI. The MINI Cooper Bilstein B16 PSS9/10 kit is a race inspired system, providing the ultimate in high performance tuning. The manually adjustable monotube gas shock absorbers feature 9 or 10-stage precise compressing and rebound settings, from comfort to competition. The threaded body allows accurate adjustability of the front and rear progressive springs to achieve the vehicle ride height (30mm to 50mm), center of gravity and level of performance handling desired. Bilstein's patented Triple-C-Technology coating ensures long-lasting resistance to corrosion. The adjustment for the rebound on these bilstein coilovers is at the bottom of the shocks front and rear. This makes them the easiest on the market to adjust in the rear as you don't have to remove them to adjust. Sold as a complete set of 4, 2 front and 2 rear.